I haven’t been able to blog in awhile do to a nasty bought of pneumonia and a heavy work schedule but finally I am back! I am in the throws of three projects so I am not in a position to reveal much but I can leak another page from Power Cubed, my creator owned series debuting through Dark Horse Comics in September. I can finally say that the release date won’t get changed since it has already been solicited and I am well into the second issue of the 4 issue mini series. 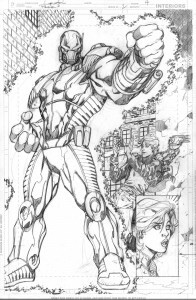 My original plan was to write, pencil and ink all four issues but that proved to be too time consuming to get the series finished in a reasonable amount of time. 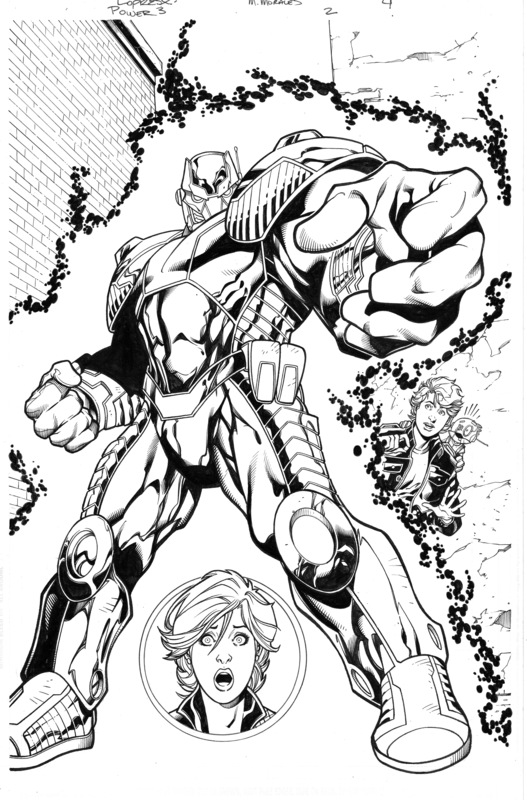 (Remember, I am working on this in my spare time as I am still fully engaged in work for DC Comics). 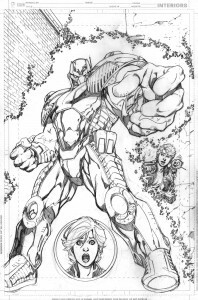 So I was able to convince one of the top inkers in the field to help me out by inking issues 2 and 3. 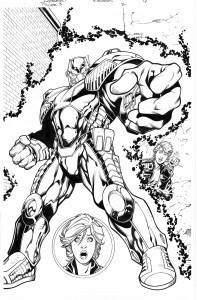 That inker is none other than former X-men and Marvel inker: MARK MORALES! Mark and I worked on a few issues of X-men together over 10 years ago and I have wanted to team up with him again ever since. I couldn’t be happier that it is on my own project! 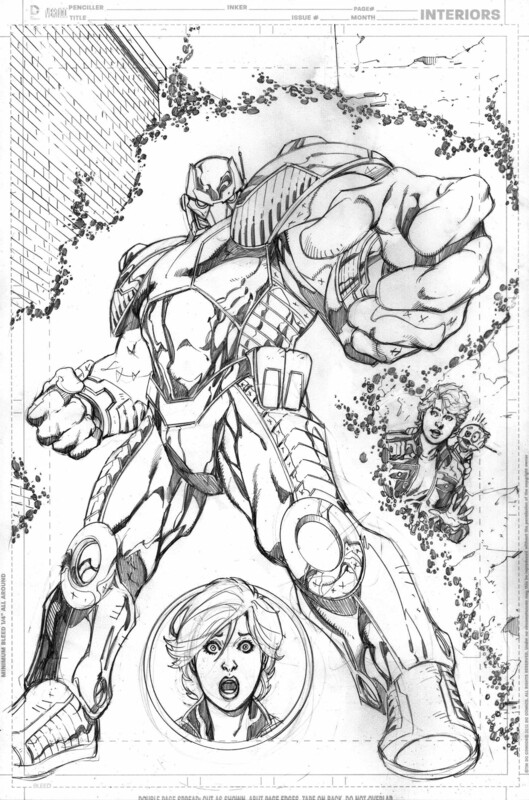 Let me show you a competed page he just sent me from issue #2. This page is interesting in that it is a re-imagined page that originally appeared in the 1st issue of Atomic Toybox (predecessor of Power Cubed) way back in 1993. 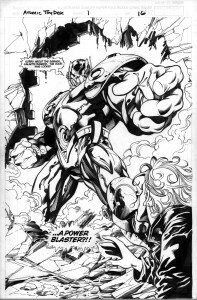 The re-write of Atomic Toybox to Power Cubed moved the big reveal of the Power Blaster from issue #1 of Atomic Toybox to issue #2 of Power Cubed. This page being a splash page had a bit of an evolutionary process to it and gave tangible evidence to the old saying “what comes around goes around” (as applied to art instead of one’s behavior). Here is what the original page looked like way back in 1993. I penciled and inked this. As you can see this is a really powerful and dynamic piece of the Power Blaster breaking through the wall of Kenny Logan’s house. Now for Power Cubed this scene takes place in a different location under different circumstances. And here is what I originally came up with. 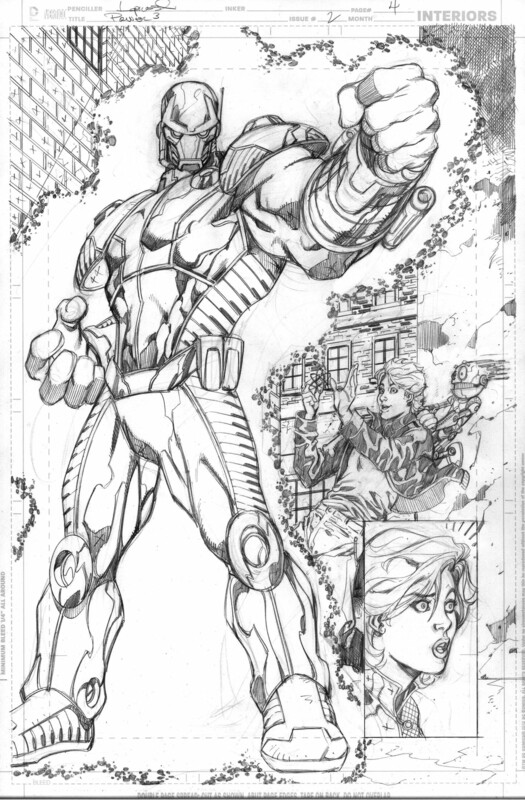 Pencils by me (of course). The question here is, “why did it take me until I finished the page to realize how boring and dull this image was”? The insert there at the bottom right is special agent Claire Covert. Pose is the same as the original, with costume updates applied. I also gave the Power Blaster 4 fingers instead of 3. Way more dynamic and cool. Now here is what it looks like after Mark inked it. Now that’s a nice page! Keep checking back for more updates on Power Cubed as the release date draws closer!